The Volkswagen Golf, Renault Clio, VW Polo and Ford Fiesta were again Europe’s favorite car models in 2017. SUVs such as the Nissan Qashqai and VW Tiguan made strong gains. In 2017, for the tenth consecutive year, the Volkswagen Golf was the best-selling car model in the European Union (EU) and EFTA countries. For the second consecutive year, the Renault Clio was second followed by the VW Polo and Ford Fiesta. The Nissan Qashqai improved to fifth as Europe’s favorite SUV. The similar VW Tiguan moved into the top-ten list of Europe’s top-selling car models with sales up by a third. There were no changes in the rank order of the top four most-popular car models in Europe in 2017 compared to a year ago. The VW Golf was again by far Europe’s favorite car model – a position it held uninterrupted since 2008. However, for the second consecutive year, VW Golf sales volumes were down in Europe. The VW Golf was the top-selling car in only 5 European countries in 2017 compared to 8 in 2016. Furthermore, more than half of all Golfs were sold in Germany and the UK with the model’s success more limited in other big markets. The next Golf is expected by mid-2019. The Renault Clio was the only top-four car model to have increased the number of cars sold in Europe during 2017. The VW Polo and Ford Fiesta both maintained their positions from a year ago but both models had sales down by significant numbers in part due to model changes during the year. 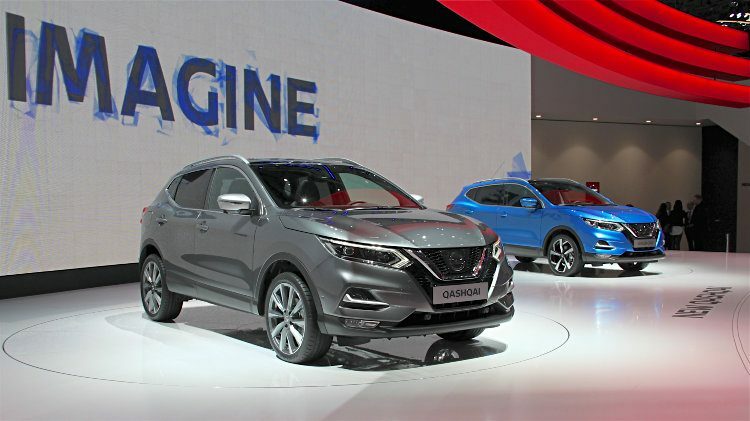 The Nissan Qashqai was again Europe’s favorite SUV and improved from 8th a year ago to 5th best-selling car model. This is the highest position not only for the Qashqai but also for any SUV in Europe. Despite slightly weaker sales, the Peugeot 208 improved one rank position from a year ago. The predecessor of the 208, the Peugeot 207 was the last car to have outsold the Golf in Europe – it was the top-seller in 2007. Sales of SUVs in Europe increased by 20% to 4.56 million vehicles in 2017. The VW Tiguan was a clear example – it increased sales by nearly a third and improved in sales rank from 18th to 7th. The Opel / Vauxhall Corsa slipped from 5th to 8th with sales down by 12%. The replacement of the Corsa, on a shared platform with the new Peugeot 208, is expected towards the end of 2018. The Skoda Octavia maintained its ninth position with sales hardly changed from a year ago. The Opel / Vauxhall Astra slipped from 6th to 10th with sales down by 14%. The two volume models of the brand that became part of the PSA Group in August 2017 noticeably underperformed compared to the equivalent Peugeot and Citroen models. The Renault Captur slipped off the top-ten list despite being an SUV. Although the Ford Focus and Toyota Yaris where the only other top-25 best-selling car models in Europe in 2017 to maintain the same sales rank position from a year ago, only one new model entered the list. The Peugeot 3008 – as SUV – entered the list at the expense of the Peugeot 308. The Citroen C3 was the most-improved model with sales up by 54% from a year ago. (The Peugeot 3008’s fantastic 555% increase is mostly due to the car not being available for the full 2016 year.) Sales of the Dacia Sandero and Renault Megane also increased sales by double digits. Amongst the worst performers were two high earners for the Volkswagen Group: the VW Passat slipped from 12th to 18th and the Audi A3 from 16th to 25th. Both models sold more than 20,000 less than a year ago. Passat sales are down 44,000 from two years ago. However, the Volkswagen Group remained Europe’s largest carmaker in 2017 with Volkswagen still the top-selling car brand. Car sales in the EU and EFTA increased by 3.3% to 15,631,687 cars sold in 2017. Electric car sales in Europe increased by 39% and hybrid car sales by 52% in 2017.